Unlike previous versions of Windows, calculator application in Windows 7 has lot of additional features and functionality. While performing multiple calculations, you may want to look back at previous data of calculations. 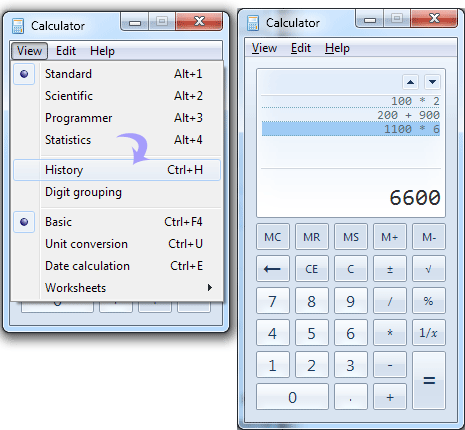 You can easily do this using ‘History’ feature of calculator program on Windows 7 operating system. 1. Click on Start > All Program > Accessories > Calculator. 2. Click on View > History or press Ctrl + H to view History. 3. The Calculator will display the data/ numbers of previous calculations. You can click on required calculations to see results. From now on, there is no need to do the calculation again and again, just use the history to see previous calculations.